Human Rights in Ukraine – 2013. 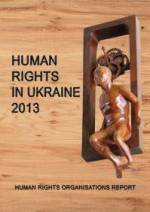 Human rights organisations report / Editor: Y. Zakharov / Ukrainian Helsinki Human Rights Union. – Kharkiv: Prava Ludyny, 2014. – 428 p.